When I have my grandson sleeping over, I always walk to the back of the house to check on him. 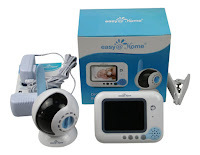 With the Easy@Home Wireless Digital Video Baby Monitor, I can monitor him while watch the television or from the master bedroom. I really could not believe how easy it was to pair the parent unit with the baby unit! Just a couple of quick steps and it was done! Plug the power chord into the camera unit. Turn the camera switch on, and hold down the "Link" button at the top until the light starts flashing. Turn on the monitor on the right hand side of the device. Press the menu button at the bottom of the monitor unit to access the pairing option. Navigate with the arrows and select the pairing option by pressing the menu key again. ou will see the pairing process start. When it is completed, the image you see on the monitor's screen is taken from where the camera is pointing. As a tip, turn the volume down to avoid a loud sound interference when you switch the monitor on. Also, you have to charge the batteries in the parent unit before attempting to use the product. It took me about three hours. The video quality is very good and the picture is very clear. The audio is also really virtuous. I love that it comes with an easy to read and understand user manual. In the box, you will find a camera, the 3.5 inch screen, a user manual, power adapters, and a clip mount. To guarantee your satisfaction, it also comes with a two years ‘Hassle Free’ Product Replacement Guarantee. Oma wishes that they had these back when she had her babies. 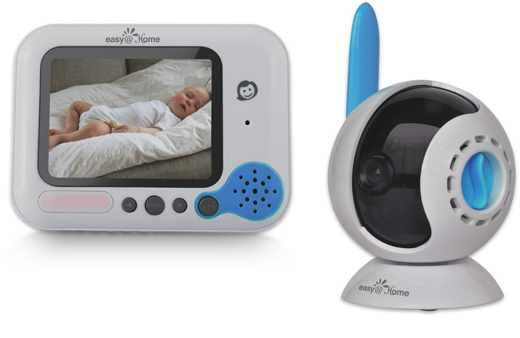 The Easy@Home EHB256 Digital Video Baby Monitor takes away your worries as you watch over your baby. This easy to set up baby monitor comes with a 3.5 Inch full color TFT screen. 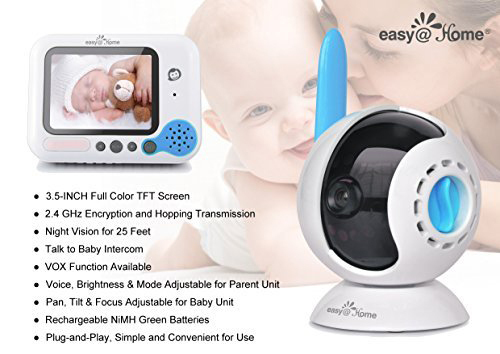 With a 2.4 GHz wireless FHSS encryption, this baby monitor provides high quality vision with secure transmission. 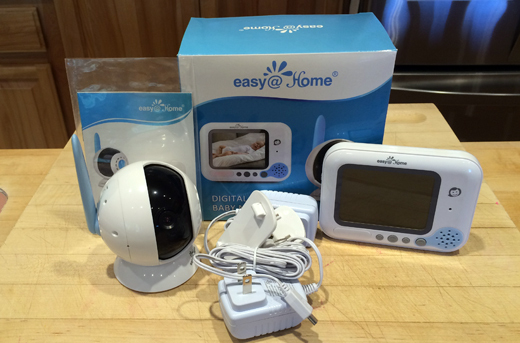 With a range of 200 meters (656 ft.), you won't be limited by distance as you monitor your baby throughout your home! A voice activation feature allows the unit to save energy unless sound is detected. Designed with user-friendly features and buttons, the EHB256 is built to help you! Watch your baby anywhere from your home: 200m long range and 2.4Ghz Encryption and Hopping transmission for high privacy and low interference. Voice, Brightness & Mode Adjustable for Parent Unit. Rechargeable NiMH Green Batteries for parent unit. Also, Pan, Tilt & Focus Adjustable camera lens for Baby Unit. Plug-and-Play, Simple set up. by Easy At Home Medical LLC, who is specialized in the medical/health tests and monitors.